FAQ | Is it happening? If you can’t find a question-answer that your happy with, add it in the comments section. 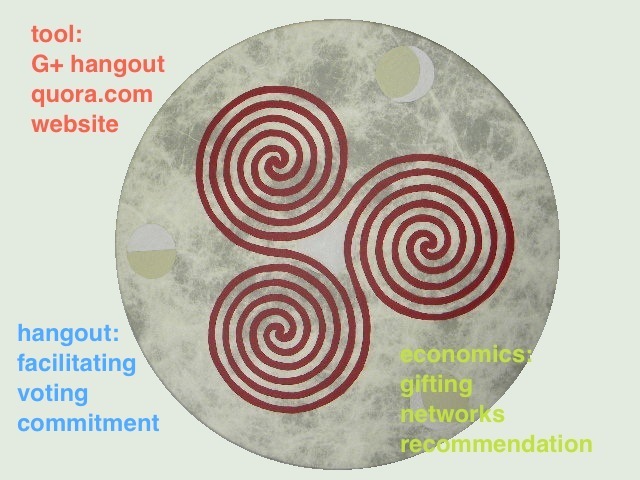 A ‘happening-hangout’ is where a network decides in one hour what the greatest social impact they can produce in the following week, within a budget commensurate with the size of network. e.g. 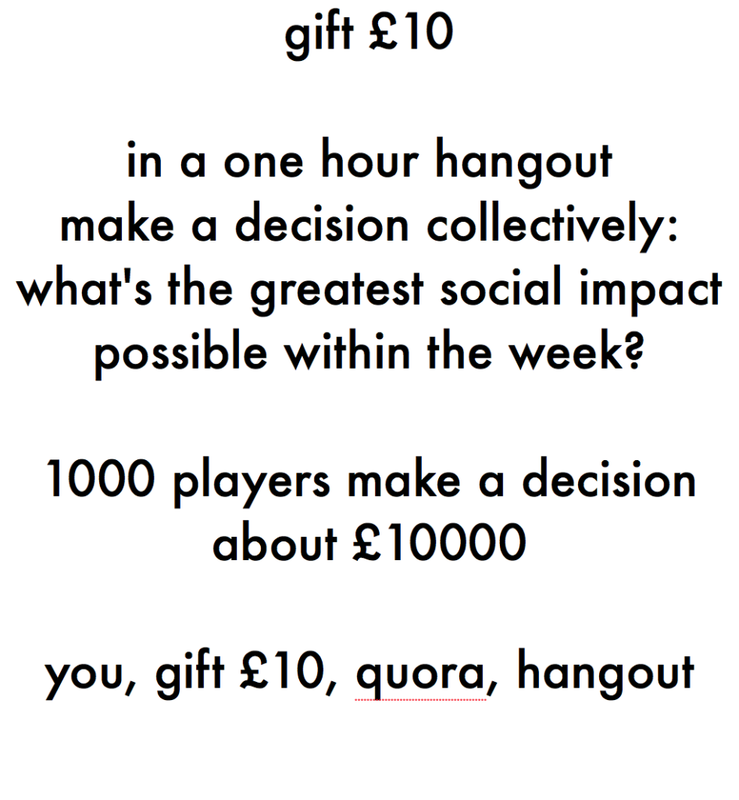 100 people decide what to do with £1000 in one hour. In this way, we learn the skills of alignment, consensus and collaboration, through direct social effect. How does a Ha-ha work? We watch a live hangout facilitated by three of us: their job is to help us determine what we will do this coming week. We all use quora.com to record our suggestions of what we will do. We contribute our solution to what we can do this week, as well as vote answers up and down, and contribute what we can do to help. By the end of the hour, we will arrive at one event that we think will produce the greatest social impact. If there are 100 of us, we will be suggesting activities that may require upto 100 of us and within a £1k budget. Your £10 is not used to buy or sell anything — it is the budget we may need for the Ha-ha. Producing social impact. No overhead, no extra costs. By getting things to happen in the real world on a weekly basis, this motivates us to participate again. And then you can start your own ha-ha’s, scope them so that they are geo-local, or involve your network. Ha-ha’s are a catalyst to turn collective motivation into action. Ha-ha’s are a bit like Kick-starter, Meet-up, and Linked-in — all rolled into one, based on getting things done. It is all based on results, social results. The way you evaluate whether this tool is any good, is based on what the results are. You don’t evaluate the tool because you like it, the buttons, or that it enables you to chat — it is about getting real results that matter in the real world. We’re learning to flock, socially. Given all our different perspectives, judgements, opinions, locations — we overcome these in order to get things done. What are the simple steps to participate in a ha-ha? Contact: we receive a personal invitation through social-media or the real world. Website: we register on a ha-ha and contribute funds. Prepare: we are notified of the requirements — access to Youtube and a Quora.com account. Participate: we watch the live-stream Google+ Hangout-On-Air on the ha-ha page, and contribute an idea and vote for social action on Quora. Action: we do the social action and witness the social impact. Feed-forwards: we share our experience in blogposts, subsequent ha-has, and invite others to participate. What kinds of activities are possible? We are not experienced at thinking of solutions that mobilise our networks effortlessly or work with large budgets weekly. Once we start getting an idea of how this trust-game works, and we experience it working, an entire world of actions will suddenly be within our range. We will only be limited by the level of trust we place in one another. As a commercial example, we create a kick-starter campaign for an idea or prototype; ha-ha’s become the social ‘starter’ motor for a bigger crowd-funding enterprise; some of the money generated from the kick-starter may be given forwards to the ha-ha participants. As a personal example, we create a website to self-publish a book one of us has already written; ha-ha’s become the social seed to crowd-fund individual projects; a share of the money generated may be given forwards to the ha-ha participants. As a meta-example, we create a bespoke platform for ha-ha’s which integrates a trust metric, eg the Subjective-Enumeration-Algorithm. As an entertainment example, we host a real-world party which is broadcast through Hangouts-On-Air, attract cultural creatives to network and effectively advertise ha-ha’s for their networks. Pay for all kids who attend a swimming pool, locally; record responses. Reward random people at a supermarket, record response. Reward those who walked or cycled to the supermarket? Invite a team locally in a city to host a ha-ha the following week. Award some artists on the internet with prizes for their animated gif, or glorious pictures; invite them to take part, and ‘advertise’ ha-ha’s with their art. What stage are we at with the Ha-ha’s? It’s early days. We’ve just co-designed the site and are looking to generate some trial ha-ha’s over September. It may take a while before we get to test our system with a large network, but when we can self-organise ourselves in a ‘swarm’ of 1000 people, and make a collective decision with £10k, then we will know that the Ha-ha’s are fulfilling their function as a social action catalyst. So, take part, let your imagination go wild, and put your trust networks to the test! Who are behind this project? This project was conceived between a few people, details of which can be found in the blog, but in truth it is a true open-source, commons, co-design. Nobody owns it. We run our own ha-ha’s just like everyone else. What little it costs to run this site is generated by ha-ha’s too. There’s no intellectual property, and no overhead costs. All money put into the ha-ha’s goes to that ha-ha’s objective. The principles which inform the design and practice of the ha-ha’s can be found at http://ecosquared.info, financial protocols based on giving, pure p2p protocols for networks, an ecological economics which promises a way for us to solve the world’s greatest social and environmental problems.